2 Should You Choose Delta For Your Kitchen Faucet? Delta is one of the largest faucet manufacturers in the world, and they have sold faucets all over the world. Their products combine looks with functionality, and the results are simply amazing. Did you know that Delta incorporates some of the latest technologies available in their products? Most of their faucets use sensors to turn the water on or off, and some of them use LED light to indicate the water’s temperature, so you can be sure it’s at comfortable levels before dipping your hands in. No matter the faucet’s type, you can be sure it will come with features which will improve your experience. In the following article, we present some of the company’s highlights, and we also take a closer look at some of their products. Our Delta Touch faucet reviews will reveal both the pros and the cons of each product. If you want to find out more about Delta kitchen faucets, read the article below. If you’re looking for a faucet you can install in a modern kitchen, you should pay attention to the following review. The Delta 9113-AR-DST is a high-quality faucet that has a sleek and modern design which will look great in most kitchens. The faucet comes with a pull-down handle that will be of great use in the kitchen. The handle has a long reach, and it will allow you to clean large pots, trays, and pans with ease. The sprayer has a magnetic docking station, so it will always slide easily back into place. The faucet has a high-arc spout which will provide a lot of clearance around the sink. Low Maintenance – This faucet uses an easy-to-clean rubber sprayer. The sprayer is resistant to hard water buildups, and it can be cleaned by simply wiping it with a wet cloth. 2 Water Patterns – The sprayer is capable of producing two water sprays. Each spray can be used for different tasks, and they will come in handy in the kitchen. Solenoid Might Be Faulty – Some customers complained that they had problems with the faucet’s solenoid. If this happens to you, contact the customer support service, as the solenoid malfunction is covered by the warranty. Conclusion: The Delta 9113-AR-DST is a nice modern-looking faucet that performs well and is very durable. 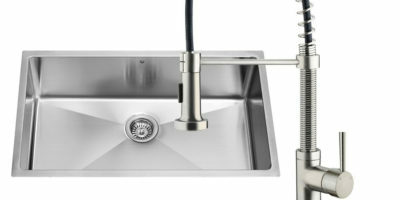 If you’re looking for a commercial-style faucet to improve your kitchen’s appearance, you have to take a closer look at Delta’s 9659T-DST model. This faucet not only looks amazing, but it’s also very functional. The 9659T-DST uses the Touch2O Technology. 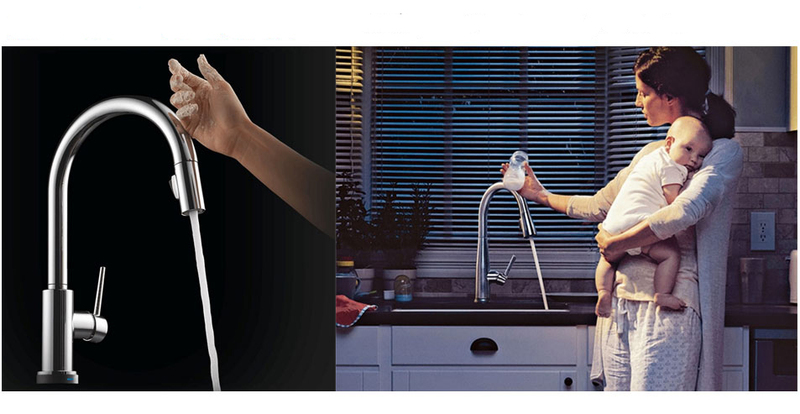 This technology allows you to start the faucet by simply touching anywhere on the spouts and handle’s surface. This is a great feature, as it allows you to turn the water on when you’re holding something. The feature also prevents you from staining the faucet when your hands are dirty. The faucet comes with a pull-down spray head that will help when cleaning the dishes. The sprayer has a long reach, and it has a magnetic docking station. Long Battery Life – The faucet uses 6 AA batteries at the same time, but a single set of batteries can last for up to 2 years. 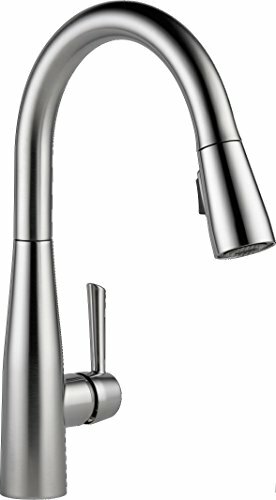 Conclusion: The Delta 9659T-DST is a good commercial-style faucet that will look great in a modern kitchen. 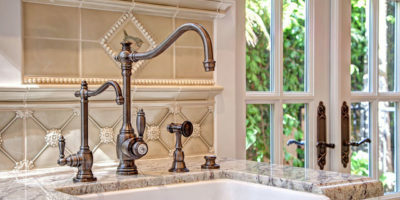 When you want to decorate your kitchen in a traditional style, you don’t necessarily have to use a traditionally styled kitchen faucet. You can use the 4353-AR-DST model instead. This faucet has a classical-inspired design but comes with all the features you would expect from a modern faucet, including a pull-out spout. The faucet uses a single handle to control both the water’s temperature and its volume, and its spout can swivel for 120-degrees. The faucet is suitable for both a 1-hole or a 3-hole installation, and it benefits from the Diamond Seal Technology. This technology eases the installation process, and it helps the faucet perform better. Elegant Design – The faucet has an elegant design that makes it suitable for both traditional and modern kitchens. Ergonomic Spout – The faucet’s spout has an ergonomic design that makes it easy to handle. The button for switching between the water patterns is placed just under the spout, and you can press it with ease at all times. Wrong Hose Length – The faucet is advertised to have a 59” hose, but has a 54” one instead. This might not be a problem for most people, but it might be for some. 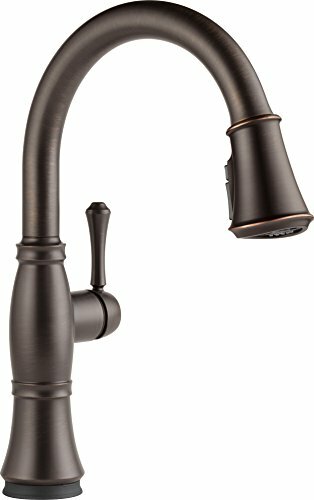 Conclusion: The Delta 4353-AR-DST is a nice-looking pull-out faucet that will fit great in both traditional and modern kitchens. If you’re renovating your kitchen, and you want it to have a traditional design, you should take a closer look at Delta’s 9197T-RB-DST faucet. This kitchen faucet has a great design, and it comes in a nice variety of finishes. Every finish is stain-resistant, and they all look great. This is the kind of faucet that will quickly become the centerpiece of your kitchen, especially if you install it on an island counter. The faucet comes with a simple touch technology, so it will turn on the water whenever you touch the spout or the handle. This technology will allow you to turn the water on even when you have your hands full, and it will be of great help in the kitchen. Great Design – The faucet is beautiful, and it will look great in most kitchen decors. The faucet is elegant, and it will attract your guests’ attention. This faucet will attract compliments all the time. Light Temperature Sensor – The faucet comes with a light temperature sensor. The LED’s light will change from blue to red as the water’s temperature rises. LED Lights Might Fail Fast – Some customers complained that the LED lights stopped working after only a few years of use. If this happens, contact the customer service for a replacement, as the lights are covered by the warranty. 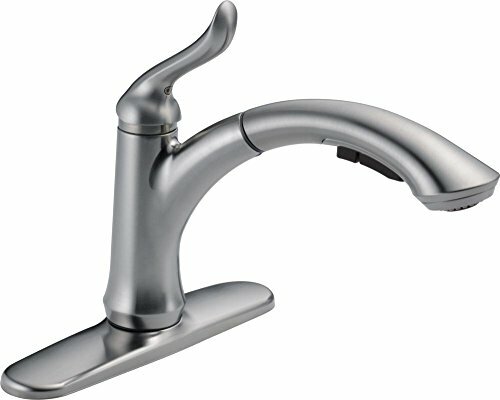 Conclusion: The Delta 9197T-RB-DST is a classical-looking faucet that will improve the appearance of most kitchens. 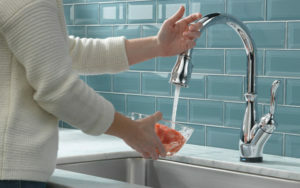 Should You Choose Delta For Your Kitchen Faucet? Delta is a world-renowned manufacturer, but some people might be wondering if they should choose one of their products for their homes. Well, we were actually wondering the same thing, and we decided to take a closer look at their products to see what makes them worth our money. Here’s what we found out about this manufacturer. – Delta integrates a lot of new technologies into their products. Almost all their faucets have specials features that will help you in the kitchen. Whether it’s a rubberized sprayer head or a water temperature light sensor, Delta faucets are designed to provide a good user experience. – Despite the fact that most Delta faucets use features that might have been considered elements of science fiction only 5 years ago, they are easy to install. All of them come with installation instructions that are easy to follow, and they include all the elements you use in the installation. – People are usually reticent to buy a faucet that uses batteries, but this shouldn’t be the case with Delta faucets. Their products work on batteries, but they can work for up to 2 years between battery changes. If you use C batteries, you can use the faucets for up to 5 years without a battery change. – If the Delta kitchen faucet you choose uses a battery, you won’t have to predict when it runs out. You will be notified by a LED when the batteries are low, so you can change them in time. – Delta is one of the manufacturers that successfully combines functionality and design. Their products are not only highly functional, they’re also very stylish. Every faucet looks great, and they will improve your kitchen’s design. – Delta uses high-quality seals and valves for all their faucets. This will increase the faucet’s durability, and it will allow them to run without leaking for a very long time. – Most of the faucets produced by Delta come with the supply lines you need to connect them to the main water line. The supply lines are made of a single piece, so they are almost leak-proof. – The faucets that come with a pull-down or a pull-out sprayer come with a wand capable of producing not one, but two water spray patterns. One of the patterns is large and it’s better suited for everyday use, while the other is narrow but more powerful, being better suited for removing difficult stains. – A powerful magnet keeps the sprayer in place when you don’t use it. This is a great feature, as the magnet won’t allow the sprayer to droop over time. The magnet also guides the sprayer back into its docking position after you finish using it. You can buy all the spare parts you might need directly from the manufacturer’s website ( https://www.deltafaucet.com/service-parts/find-a-part ). The website uses a search feature that allows you to find the spare part you need with ease, by just typing the part number, model, or a keyword in the search box. You can also find spare parts for Delta faucets at most local large retailers. If your faucet stops working properly and you can’t identify the cause, try contacting the customer support service. The manufacturer’s specialists should be able to help you identify the problem, and they should also recommend a solution for it. All the faucets produced by Delta come with a limited lifetime warranty for their construction and finish. The warranty extends to all the manufacturing faults, as well as those related to craftsmanship. If the faucet uses any electrical parts, these will be covered by the warranty for a period of 5 years. The warranty does not extend to the batteries. The manufacturer will repair or replace the faulty unit free of charge during the warranty period. If the repair and replacement are not practical, the manufacturer might choose to refund your purchase price. You should contact the manufacturer’s customer support service if you encounter any problems with a product. You can contact the service either by email or telephone. Delta’s customer support service specialists are familiar with the company’s products, so they will provide valuable information. Delta incorporates some of the latest technologies in their products. Here is a list of technologies you might encounter if you choose one of their products. – This technology allows you to start the water without using the faucet’s handle. All you need to do is to touch the faucet on the spout or on the handle and the water will turn on. – The faucets have a temperature sensor that controls an LED light signal. The LED will change colors between blue, magenta, and red depending on the water’s temperature. – If the faucet uses batteries, a LED light will notify you every time the batteries are running low. This is a great way to make sure the faucet will always use fresh batteries. Check out Top-Rated Touchless Kitchen Faucet Reviews here! One of the advantages of choosing Delta for your kitchen faucet is that their products are durable. All of them come with a limited lifetime warranty, but most customers don’t use it because the faucets never break. Another advantage is that their products combine functionality with design, so you will get a faucet that not only looks good but also works well. Not only that, but these faucets are also easy to install. They come with an installation guide, and if you encounter any problems during the installation, you can also watch the video tutorials the manufacturer posted on its website. We’re certain that after reading our short selection of Delta Touch faucet reviews, you are now able to determine which is the best faucet model for your kitchen.